gave me a way of visualizing what I had on my mind, but to figure out the math, I needed something significantly more absolute than “That look’s about right.” So, I turned to buckyballs. By pretending that the geometric shapes composing a buckyball are actually gears, I had a good geometric model of the SCORG. The picture above is of what I like to call a 5-4-3 buckyball (meaning one composed of 5-sided, 4-sided, and 3-sided polygons). While this has the potential to lead to a beautiful SCORG, there are just too many gears to create a real-life 3D model (my end goal). So, I decided to go with a smaller 5-3 model, having a total of 30 gears. This is the configuration I will show you how to derive throughout the rest of this post. Rejoice; it also happens to be significantly less complicated than solving the 5-4-3 configuration shown above. 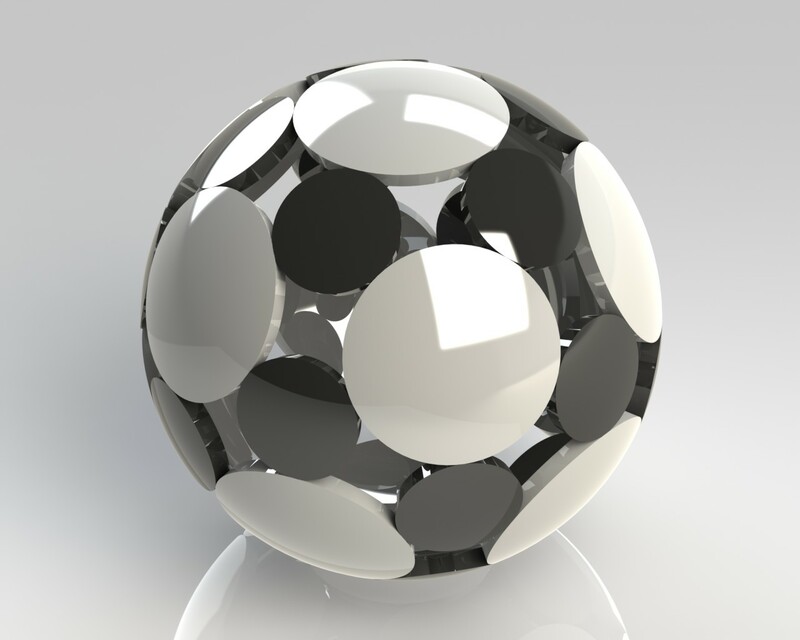 Select a buckyball which characterizes both the number of gear sizes and the general positions with polygons. 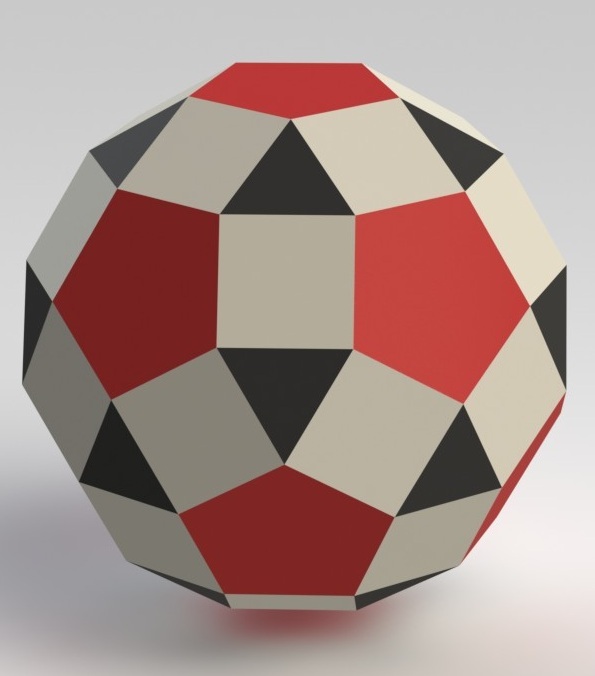 Further simplify the characteristic buckyball with a second buckyball contructed of a single polygon which marks the positions of the first buckyball’s polygons in some way. Select a radius for the SCORG in terms of the 2nd buckyball and its polygon’s geometry. Using the selected radius and the positions of the gears (marked by the 2nd buckyball’s polygon), determine the angles between gears. Find a variable expression for the radii of the gears with respect to the angles and selected SCORG radius. Using the expression for gear radii, solve for gear radii which result in a constant diametral pitch for all gears (ratio of radii should be a ratio of integers). This can be very difficult or impossible for configurations with more than two types of gears. Finally, determine the exact radius of the SCORG. This may sound complicated (and honestly, it probably is), but I will walk you through each of these steps in a (hopefully) understandable manner. If clarification is needed, please let me know in the comments. It is important that the gears actually turn once the SCORG is assembled. To ensure that this happens, we need to select a buckyball configuration that will not gridlock. Gridlocking occurs when any given loop of gears contains an odd number of interfacing gears. For example, consider a loop of 3 gears. Suppose the first gear in the loop is moves counterclockwise. Naturally, both gears interfacing with the first gear must turn the opposite direction, clockwise. However, those two gears also interface with each other, and thus cannot both rotate the same direction. Since the gear setup requires the gears to rotate in both directions, motion is not possible. This is called gridlocking, and occurs in all loops containing an odd number of interfacing gears. For a loop of gears to not be gridlocked, exactly half the gears must rotate clockwise, and the other half must rotate counterclockwise. 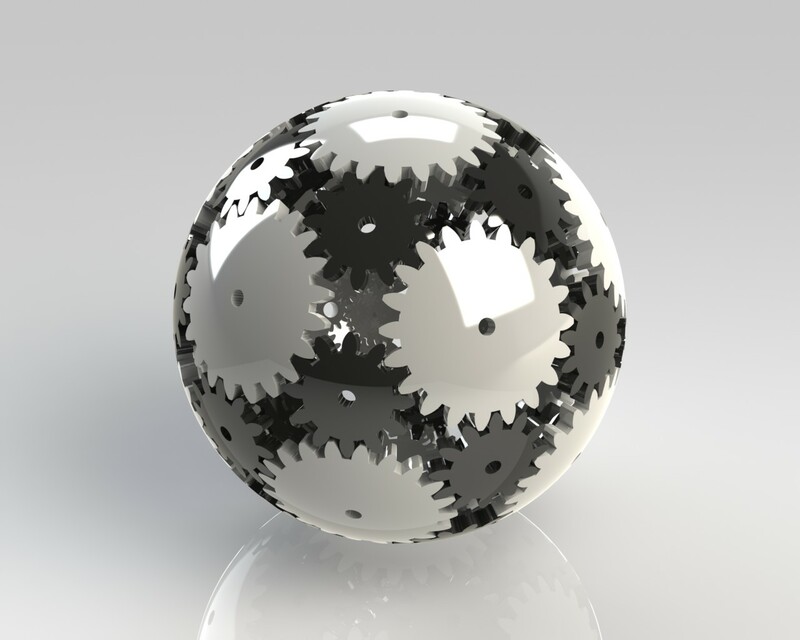 Obviously then, a characteristic buckyball should be selected so that all loops of gears contain an even number of interfacing gears. 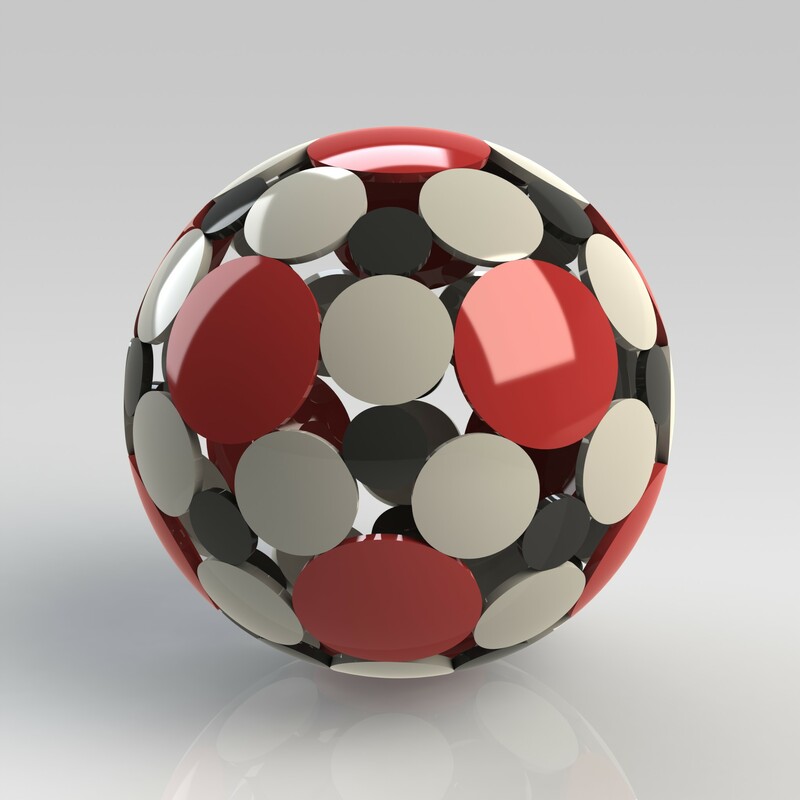 As I mentioned already, I chose a 5-3 configuration for my characteristic buckyball (shown below). Imagining that the geometric shapes are gears which interface at the polygon edge midpoints, it can be seen that gridlocking will not occur since all possible loops contain an even number of gears. Here’s a cover of The Economist. 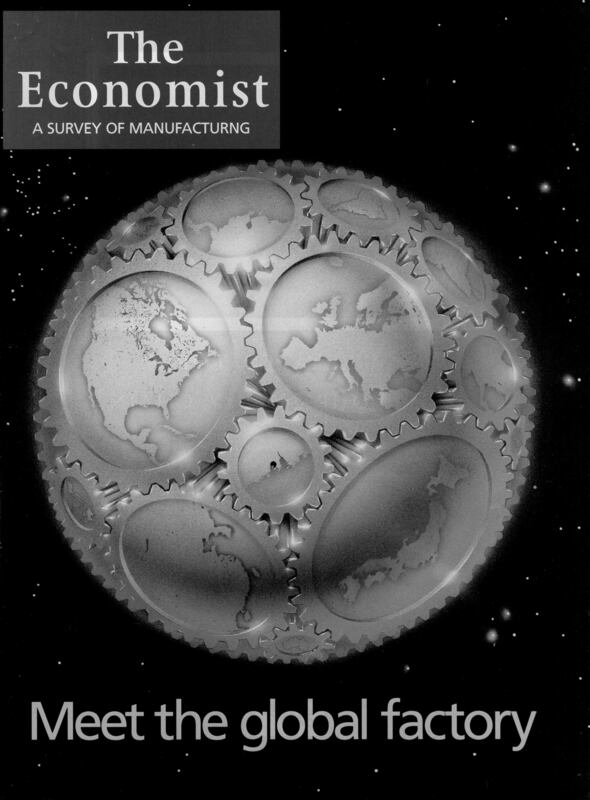 Do you expect this “global factory” to succeed? The angles between gears relative to the centerpoint of the SCORG will be the same as the angles between polygons relative to the buckyball’s center. Thus, if we can find the angles between polygons, we know how the gears need to be positioned. We can simplify this process by combining clusters of polygons into a single, repeating polygon. The important thing is to make sure that this polygon has geometry with which to identify the positions of the center points of the original polygons in the buckyball relative to the center of the buckyball. 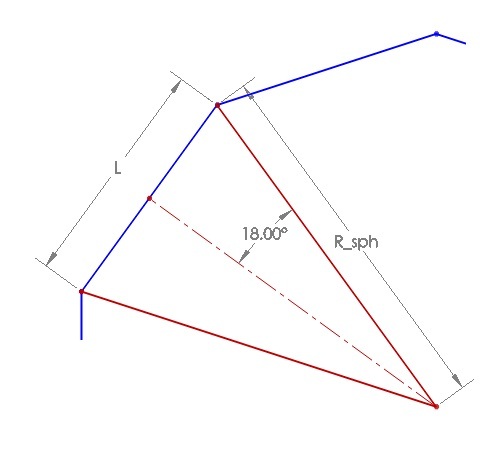 In other words, this characteristic polygon should have a way of marking the angles of the original polygons. 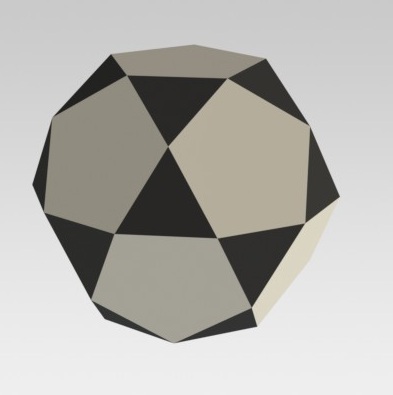 In the case of the 5-3 buckyball, the best characteristic shape is a pentagon. 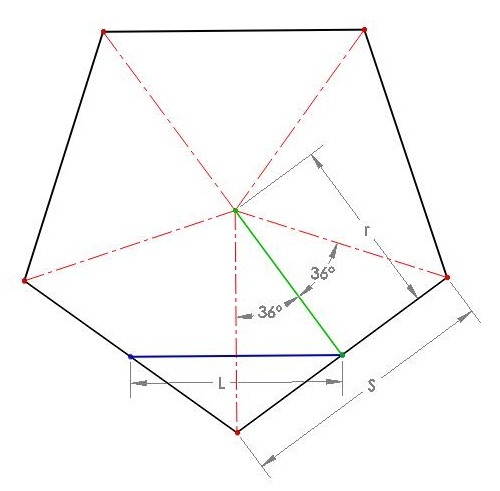 Pentagons can mark the angles relative to the centers of the triangles with their corners and the and the angles relative to the centers of the pentagons with their centers. Below is an image of a characteristic pentagon (red) demonstrating this. Note that because the geometry of the characteristic pentagon, the center points of the original polygons, and the center of the original buckyball intersect the same lines, the angles are preserved. Here is an image showing the characteristic buckyball circumscribing the the original buckyball. 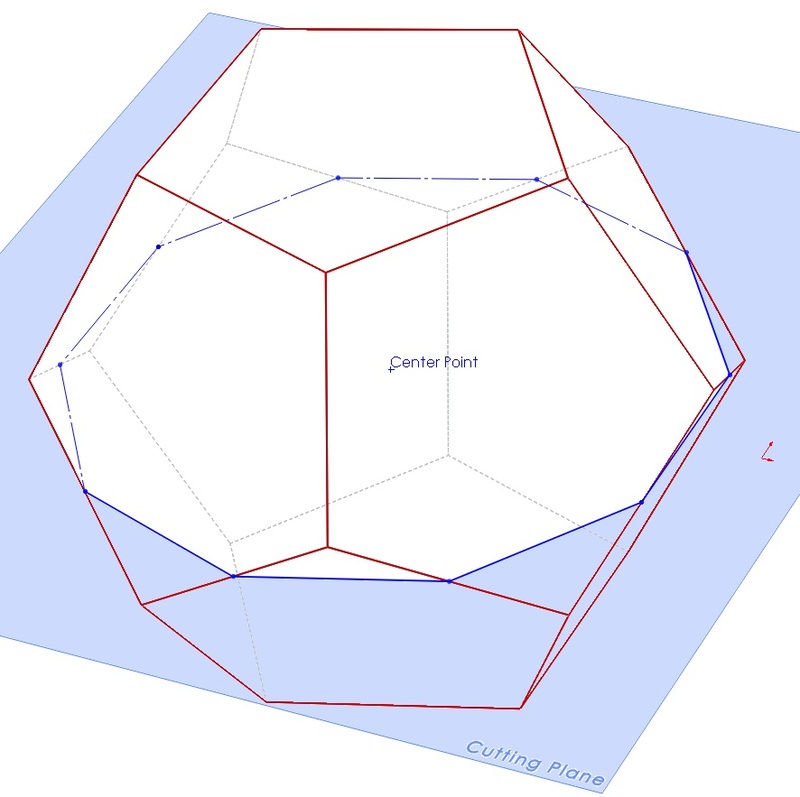 Again, visually note how the angles between the centers of the original polygons are preserved by the corners and centers of center of the characteristic pentagon. 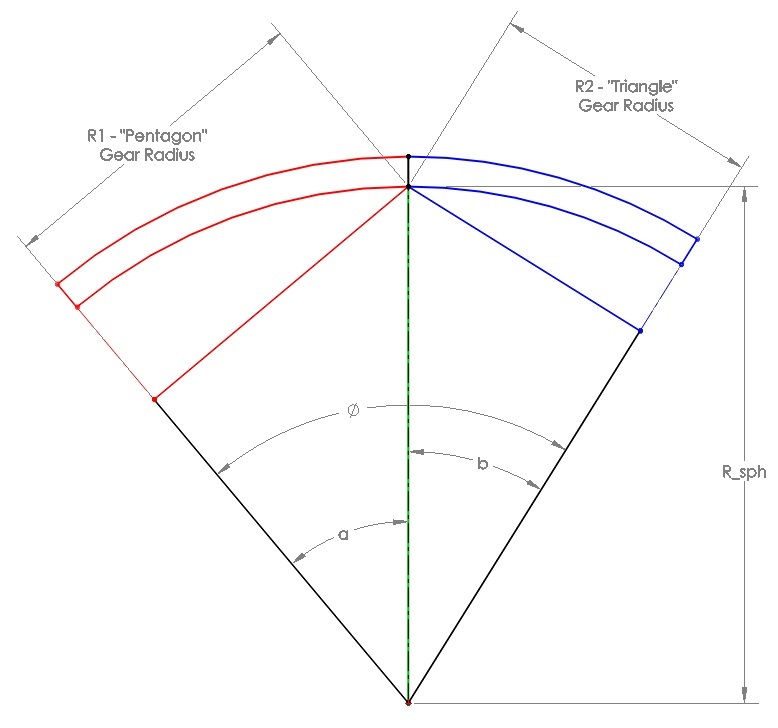 Now that we have chosen the characteristic pentagons to mark the angles between the SCORG’s gears, the next step is finding the radius of the SCORG. Since we are defining the positions of the gears composing our SCORG in terms of angles, the value of the SCORG’s radius doesn’t matter. The only things that matter are that (1) the radius is defined as an expression of the characteristic pentagon’s geometry and (2) that we use this radius expression consistently and appropriately during later calculations. To find a radius, we take the simplified buckyball and arbitrarily pick points along the characteristic pentagons at which we want the distance from the center of the sphere to equal the radius. Obviously, the selected points should be a constant distance from the center of the buckyball since the radius needs to be constant (or you’ll have a very confused-looking SCORG). For my SCORG, I chose the distance from the center of the buckyball to the midpoints of the pentagons’ edges to be the radius. In the previous image, the selected radius locations are given by the dashed circles. Note that I could just as easily have picked the distance from the center of the buckyball to the center points of the pentagons to be the radius, or the distance from the center of the buckyball to the corners of the pentagons. 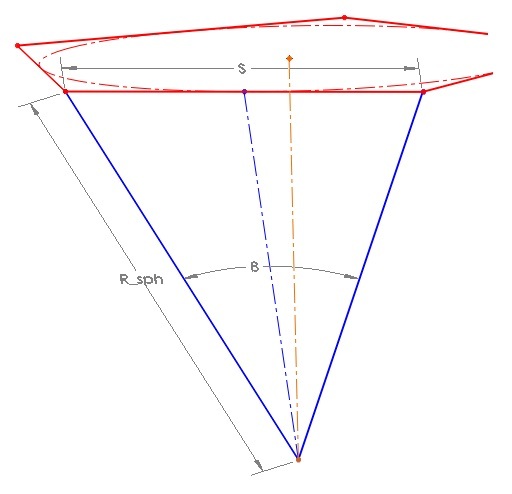 Once the radius points have been selected, we take the simplified buckyball and, using a plane which intersects the center point of the buckyball and at least some of the radius points, make a bisecting cut of the buckyball. There are a variety of ways in which we could do this, but I chose to do so as shown below. The dark blue outline around the buckyball indicates where the cutting plane intersects the buckyball. Note that this forms a regular decagon (10-sided polygon with equal sides and angles). The dark blue dots at the vertices of the decagon indicate the radius points on the buckyball which intersect the cutting plane. Looking at the decagon, we can find an expression for the radius, R_sph, in terms of the side length, L (an unknown function of the characteristic pentagon). 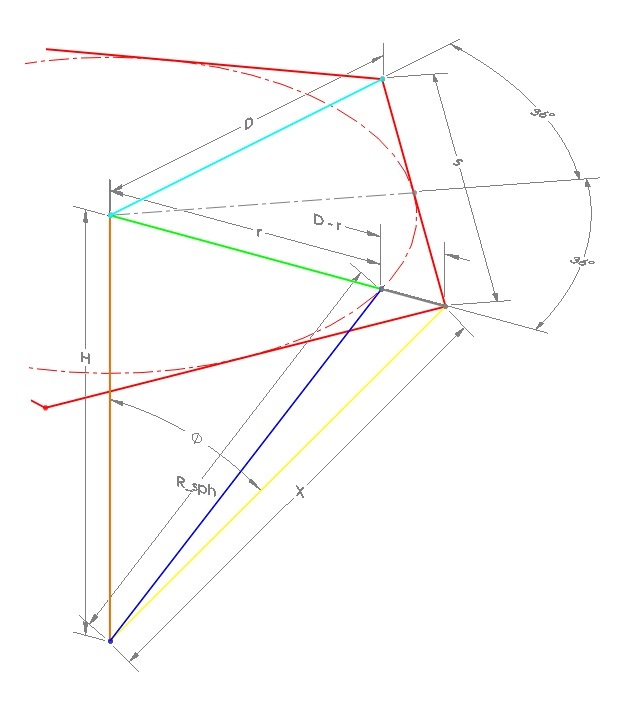 This is the value for the SCORG radius in terms of the characteristic pentagon’s side length, S.
Now that we have the radius the SCORG, we turn our attention to finding the angles between gears. 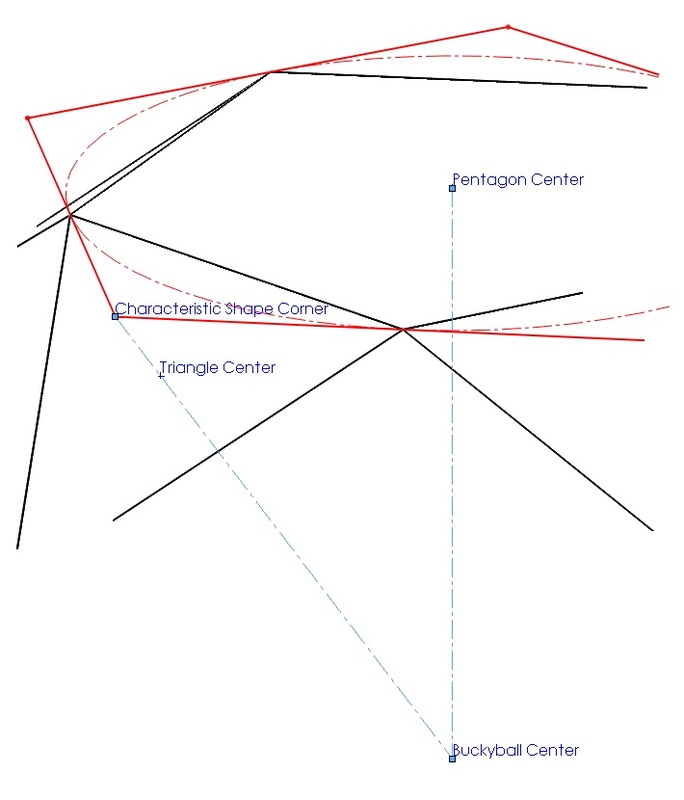 The first angle we will calculate is between the centers of the pentagon and triangle. Remember that the characteristic pentagon was set up so that its corners marked the center locations of the triangles, and so that its center marked the center of the original pentagon. 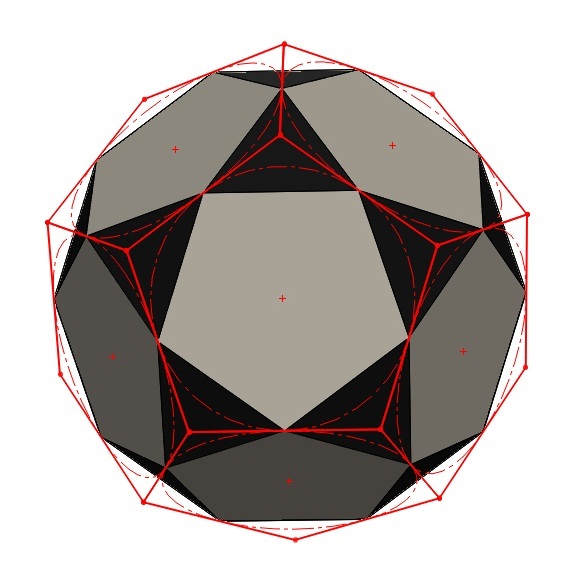 Consequently, the angle between a pentagon and neighboring triangle on the original buckyball is the angle between the center of the characteristic pentagon and one of its corners relative to the center of the simplified buckyball. To find this angle (Ø), we need to know two values: D and H. Once we have these, we can use the inverse tangent to solve for Ø. Note that because both D and H include S in their numerators, this unknown value will cancel. The final value for Ø is, to far too many decimal places, 37.37736814 degrees. We now have the angle between the triangle and the pentagon. The next step is to find the angle between two triangles. This is the angle between any two neighboring corners on the characteristic pentagon relative to the center point of the buckyball. This value is 44.9110304 degrees. We now have the angles for each gear relative to all neighbors. This value is 41.8103148828 degrees. The next step in this process is to determine the radii for all gear types. We want the edges of each gear to interface with the edge of its neighboring gears. If one gear radii is too small, the pair of gears will not interface. If one gear is too large, the gears will overlap (physically impossible). When both gears’ radii are just right, the gears will interface. The point at which they interface will lie on the SCORG’s radius. First, determine the value desired for the ratio R1/R2. This value is the ratio of teeth on the gear having ratio R1 to the number of teeth on the gear having ratio R2. Since the gear having ratio R1 will interface with 5 gears, and the gear having a radius R2 will interface with 3 gears, I want the number of teeth on each to be multiples of 5 and 3, respectively, so that they will properly mesh. Thus, I choose 5/3 for the ratio R1/R2. I could also choose 5/6, 10/3, 45/33, or any other ratio with the required multiples. With the ratio selected, adjust the angle ‘a’ until the desired ratio is achieved (I used Excel’s solver add-in). Now, plug the value of this angle into the equations for R1 and R2 to solve the radii of the gears. For a ratio R1/R2 = 5/3, we get angle a = 23.52241845 degrees. Next, choose radii values for R1 and R2 such that the radii ratio is satisfied. For example, since my ratio is 5/3, I could use R1 = 1.25” and R2 = 0.75”. Now, solve for the radius of the SCORG using the equation for either R1 or R2. For the radii selected, Rsph = 3.13198541 inches. As demonstrated, the procedure detailed above drives the radius of the SCORG. If the SCORG needs to fit in a certain area, establish the radius beforehand. Use the same procedure as above to find angle ‘a’. Instead of arbitrarily picking the radii, however, instead use the equations for R1 and R2 in terms of R­­sph. Note that this will likely give radii values for R1 and R2 that are more difficult to work with. The final step is to model or build the SCORG. On thing to keep in mind when building the gears: the gear teeth should slope radially outwards to ensure that there is not over/underlap of the the gear teeth. I hoped you enjoyed this tutorial/derivation/explanation. If you have any questions, please let me know below. Thanks! This entry was posted in How To, Nerdy, Projects by Eric. Bookmark the permalink.